A sweeping debut novel drawn from a history shrouded in secrets about two women-one American, one Japanese-whose fates become entwined in the rapidly changing world of late-nineteenth-century Japan. When nine-year-old Aurelia Bernard takes shelter in Kyoto’s beautiful and mysterious Baishian teahouse after a fire one night in 1866, she is unaware of the building’s purpose. She has just fled the only family she’s ever known: after her French immigrant mother died of cholera in New York, her abusive missionary uncle brought her along on his assignment to Christianize Japan. She finds in Baishian a place that will open up entirely new worlds to her- and bring her a new family. It is there that she discovers the woman who will come to define the next several decades of her life, Shin Yukako, daughter of Kyoto’s most important tea master and one of the first women to openly practice the sacred ceremony known as the Way of Tea. For hundreds of years, Japan’s warriors and well-off men would gather in tatami-floored structures- teahouses- to participate in an event that was equal parts ritual dance and sacramental meal. Women were rarely welcome, and often expressly forbidden. But in the late nineteenth century, Japan opened its doors to the West for the first time, and the seeds of drastic changes that would shake all of Japanese society, even this most civilized of arts, were planted. Taking her for the abandoned daughter of a prostitute rather than a foreigner, the Shin family renames Aurelia “Urako” and adopts her as Yukako’s attendant and surrogate younger sister. Yukako provides Aurelia with generosity, wisdom, and protection as she navigates a culture that is not accepting of outsiders. From her privileged position at Yukako’s side, Aurelia aids in Yukako’s crusade to preserve the tea ceremony as it starts to fall out of favor under pressure of intense Westernization. And Aurelia herself is embraced and rejected as modernizing Japan embraces and rejects an era of radical change. 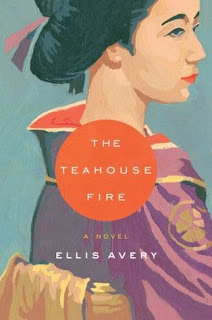 An utterly absorbing story told in an enchanting and unforgettable voice, The Teahouse Fire is a lively, provocative, and lushly detailed historical novel of epic scope and compulsive readability. It has been a while since I was so into a book that I stayed up way passed when I should have gone to bed to finish it; well that is exactly what I did with the Teahouse fire. This story is compelling and beautiful I never would have thought it was a debut novel if I had not been told. Ellis Avery weaves a beautiful tapestry of a story that follows the life of one girl from girlhood through to adulthood. Young Aurelia starts her young life in New York City a modest and happy life with her Mother and her Uncle Charles. But when she is Nine years old her Mother takes sick and her Uncle Charles takes her to Japan things go from bad to worse once in Japan until the night of a fire which sends Aurelia fleeing for her life and away from her Uncle Charles who is not as chaste as he claims to be. The night she flees, she is found by Yukako and begins to her live as a Japanese servant in her household. The story has so many levels of love and dedication it is impossible to put into words just how beautiful all of them are. You can also learn about the beautiful art of the Japanese Tea Ceremony, and follow the fight of a great family in tea to keep their art as just that an art. An important and beautiful social part of Japanese culture. The Teahouse fire takes many twists and turns some of them you see coming, and some of them you truly do not. You will grow to love the characters and find yourself attached to them. I highly recommend this book for anyone who is a little bit interested in Japanese history. This entry was posted on Tuesday, February 23rd, 2010 at 7:00 am	and is filed under Review. You can follow any responses to this entry through the RSS 2.0 feed. You can leave a response, or trackback from your own site.